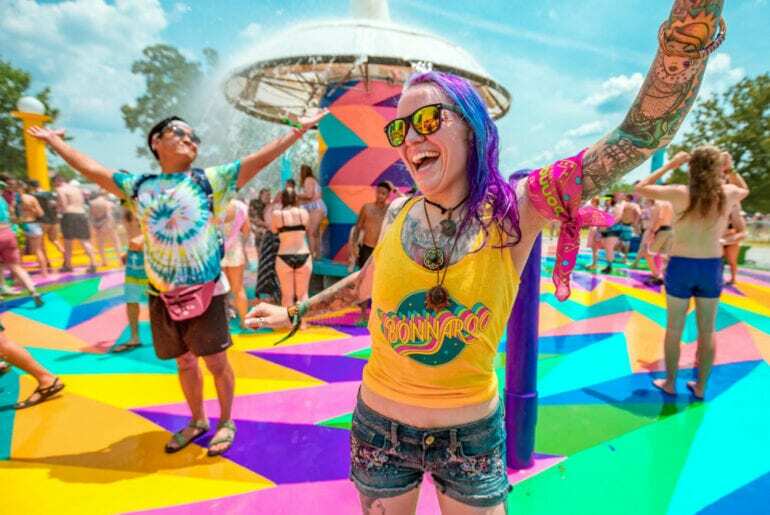 The Bonnaroo Music and Arts Festival is a four-day event that takes place in Manchester, Tennessee at the 650-acre farm, Great Stage Park. If you’re wondering where to stay for Bonnaroo this June, we’ve rounded up the best Bonnaroo Airbnb homes in Nashville and Murfreesboro below. Lots of festivalgoers like to camp out at Bonnaroo for the experience. If you’re looking for something a little more luxurious, why not book a fantastic Airbnb for you and your friends instead? Beyond the campgrounds, the best places to stay for Bonnaroo are Nashville and Murfreesboro. Also the capital of Tennessee, Nashville is an awesome city to visit anytime, with tons of legendary live music venues including the famous Grand Ole Opry House. You can also take advantage of the convenient Nashville to Bonnaroo shuttle to take you to and from the festival. Murfreesboro is another great choice because it’s only about 30 miles from Bonnaroo. There are lots of interesting things to do in Murfreesboro, too, from trying lots of Southern food to learning about local Tennesseean history. The best Airbnbs for Bonnaroo will surely get snapped up long before the festival kicks off in June! Check out our favorite places to stay near Bonnaroo below. This effortlessly cool and casual loft is a great choice for Bonnaroo festivalgoers. This stylish loft Airbnb in East Nashville is available over Bonnaroo weekend for just $165 a night. The huge master bedroom is set up with two comfy queen beds, making this space ideal for two friends or two couples traveling to the festival together. We love the mid-century modern styling, which highlights original architectural features while providing many modern upgrades. Kick back and relax in the inviting main room, with soaring loft ceilings and an open-concept layout. There’s plenty of room to relax in the lounge space, enjoying the smart TV with Hulu, Netflix, and Amazon Prime already set up for you. Whip up something delicious in the spacious, well-equipped kitchen, or head out to trendy East Nashville and try one of the multiple nearby restaurants. 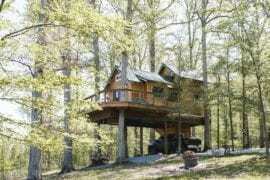 This is the perfect little crash pad to return to after a fun-filled day enjoying Bonnaroo! Murfreesboro, Tennessee is just around 30 miles from the festival grounds at Great Stage Park, making the town a convenient place to stay for Bonnaroo. 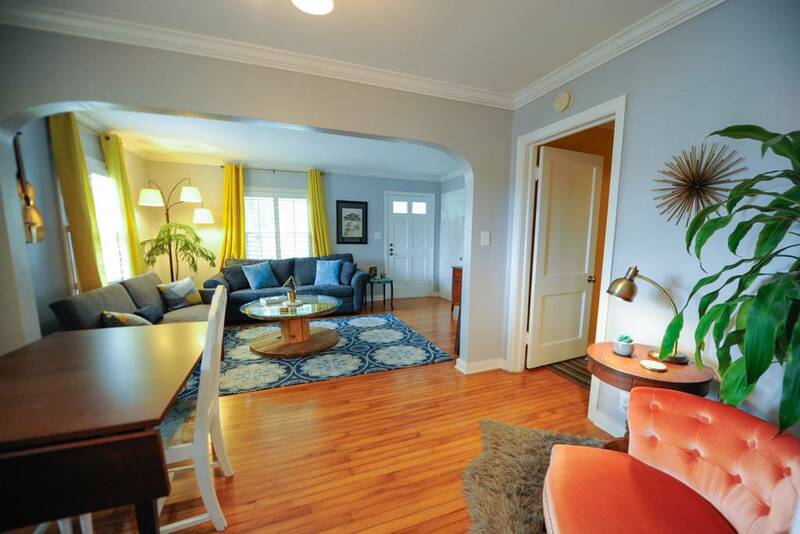 This colorful, 1950’s style bungalow Airbnb in Murfreesboro is available over Bonnaroo weekend for around $195 a night. 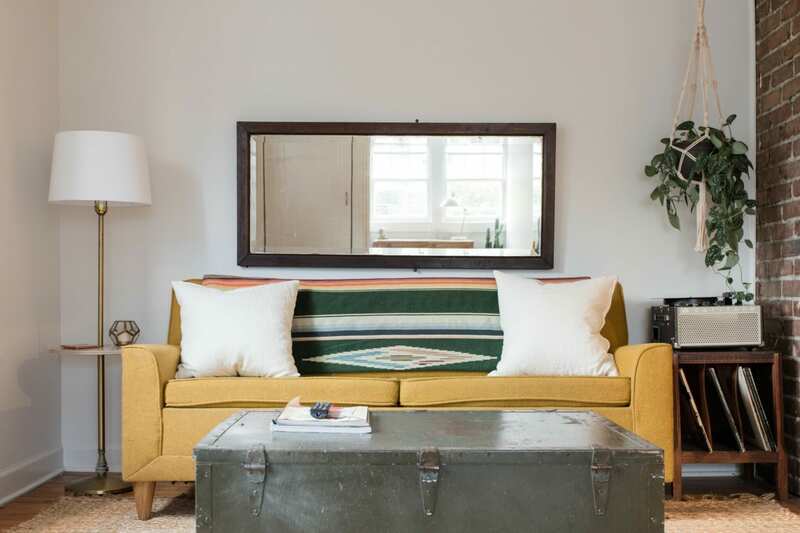 Dripping with mid-century modern style and bursting with bold color, this quirky and unique Bonnaroo Airbnb is sure to please. 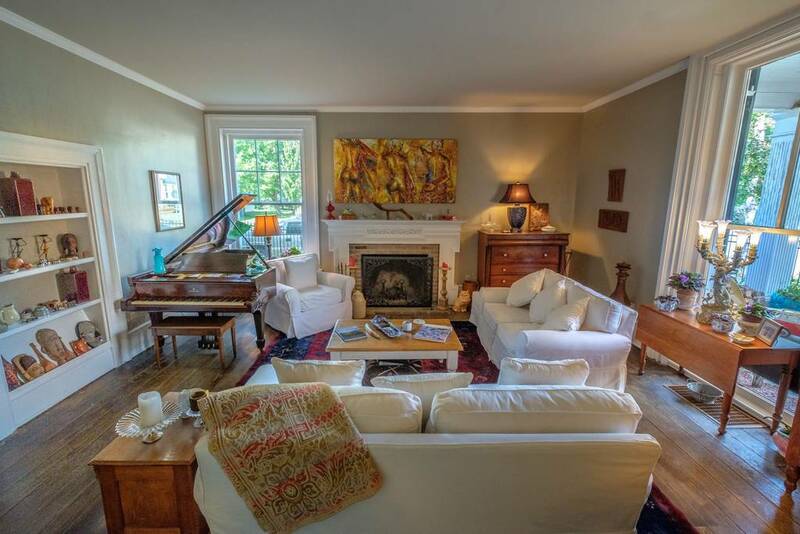 This stylish Murfreesboro vacation rental can accommodate 4-6 guests easily, with two bedrooms and one bathroom. There’s even a sleeper sofa in the living space! We love that the host has even provided a selection of vintage board games, making this Airbnb a fun place to return and relax after all the fun of Bonnaroo. 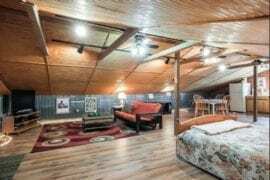 Why would you want to stay in a tent at Bonnaroo when you could book this incredibly luxurious Nashville tiny house Airbnb instead? Located in Nashville’s Woodvine neighborhood, you’re just moments away from some of the city’s most diverse and flavorful eateries. You have a fully-stocked kitchenette inside though, in case you prefer to cook something yourself! 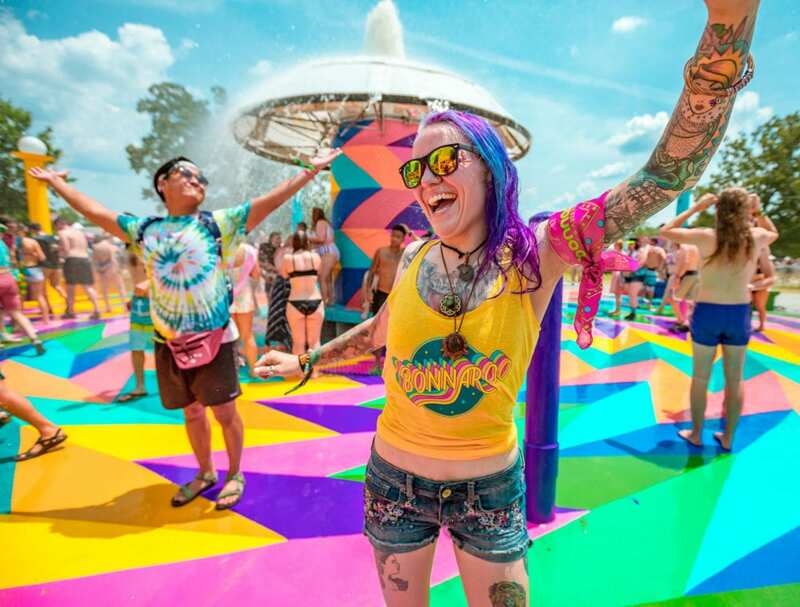 Ideal for a couple or an adventurous solo festivalgoer, you can easily take advantage of the shuttle from Nashville to Bonnaroo and still be well-placed to hang out in the city. Enjoy all the creature comforts of a luxury home, like a smart TV with Netflix, a comfy bed, and an enormous backyard with deck. Spread out on the hammock and let the twinkling fairy lights and starlit sky drift you off to a peaceful snooze. 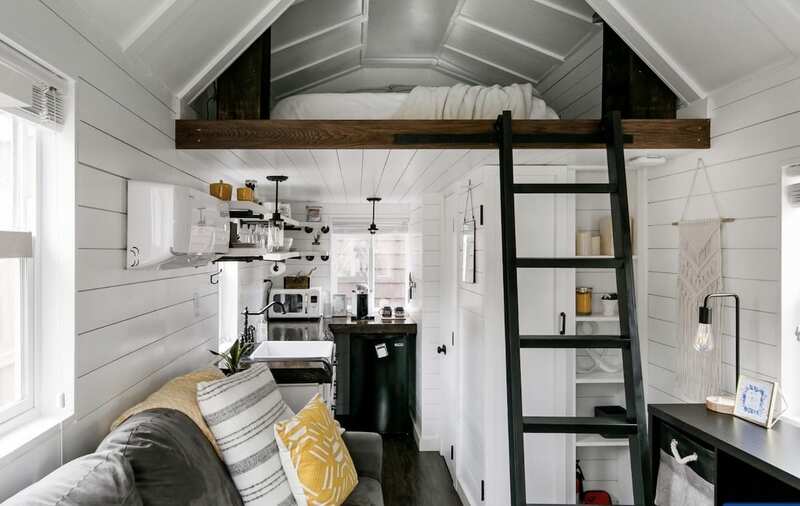 This incredible Nashville tiny house Airbnb is available over Bonnaroo weekend for around $150 a night. 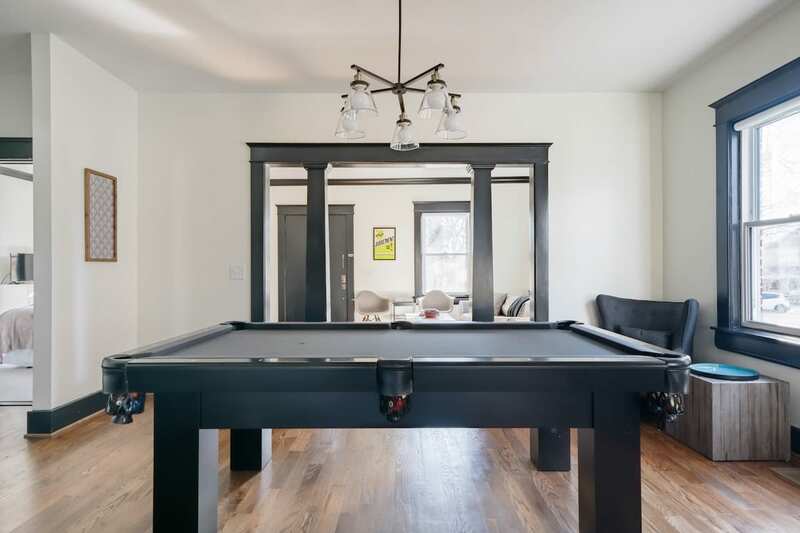 Complete with covered front and back porches, a huge living space, and a recreation room with pool table, this stylish 12th District Nashville vacation rental is ideal for a group of friends heading to Bonnaroo. 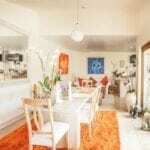 The house can accommodate four guests easily, with two big bedrooms and two full bathrooms. The home is styled to perfection using classic shades of navy blue and gray, gleaming hardwood flooring, and high-end furnishings. This beautiful Bonnaroo Airbnb in Nashville has plenty of space to stretch out and chill as a group or curl up with a book in privacy. Nashville’s 12th District is less than a block from all sorts of cool restaurants, bars, and boutiques, with plenty to do within walking distance of the Airbnb. 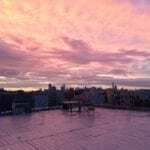 Reach downtown and Nashville’s excellent nightlife in just a short drive and bike ride! This great vacation rental could be yours over Bonnaroo weekend from $279 a night. We love all the bold splashes of color found throughout this Murfreesboro cottage Airbnb near Bonnaroo. This surprisingly roomy, 1950’s cottage is oozing with charm and character, available over the festival weekend from around $250 a night. This rental can accommodate a group of up to 8, with two queen bedrooms, one with two twin beds, and an additional sleeper sofa in the living room. There’s a great flow throughout the house with lots of cool, quirky decor adding an element of fun. The kitchen is absolutely enormous and opens onto a dining space which flows into the main living area. This house has everything you need for a fun-filled weekend exploring the culture and sounds of Middle Tennesse, so be sure to book this one quick if you need a place to stay for Bonnaroo. 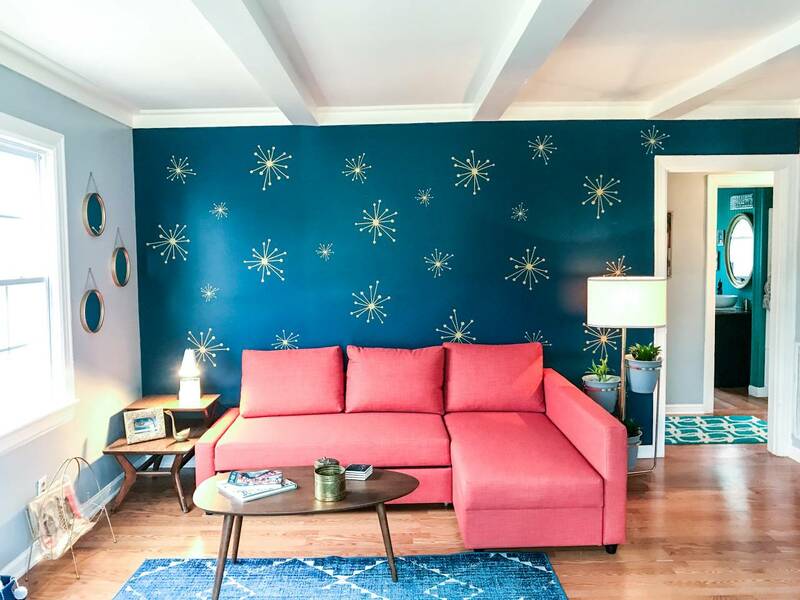 Some of Nashville’s best restaurants, distilleries, and art galleries can be found in Wedgewood-Houston (aka WeHo), where this trendy, four-bedroom townhouse Airbnb awaits. 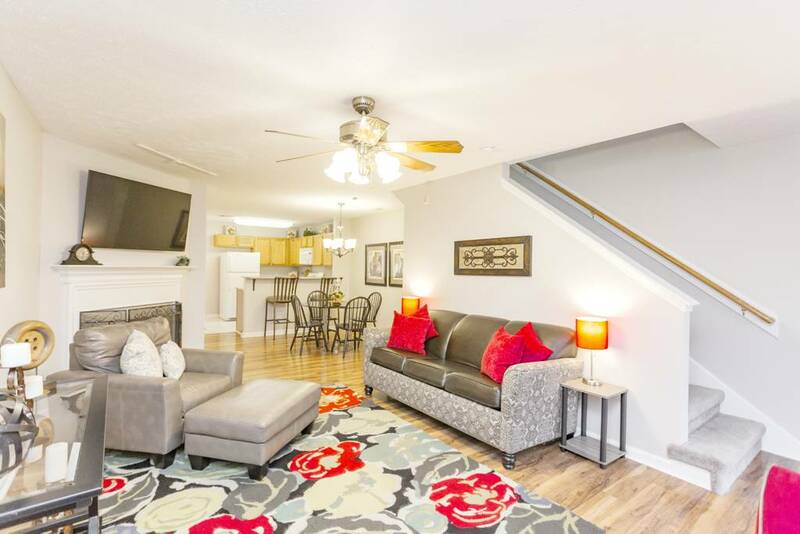 Available over Bonnaroo weekend for around $500 a night, this exceptional tri-level townhouse has everything you need for a chic stay, and more! There’s space for up to 12 guests with four big bedrooms and three full bathrooms, so this Nashville vacation rental would be perfect for a group of friends looking for a place to stay for Bonnaroo. Inspired by pop art, the owner has left no detail untouched in designing this brand new, 1,915 sq.ft. townhome. There’s lots of space to unwind in the open living area, prepare something tasty in the modern chef’s kitchen, and sit down for a proper meal together. You’ll love returning home from an exciting day at Bonnaroo to an inspiring, stylish Nashville Airbnb in WeHo. Built in 1847, this is absolutely one of the most unique Airbnbs near Bonnaroo! This charming, historic home in Murfreesboro, Tennessee is full of character and original architectural details. It’s even listed on the National Register of Historic Places! If you prefer to skip hustle and bustle of Nashville, you’ll definitely want to book the biggest and best Bonnaroo Airbnb in Murfreesboro instead. Available over the festival weekend for around $675 a night, this elegant Antebellum home can accommodate groups of 9 easily. There are three bedrooms and 3.5 bathrooms, all individually decorated with a mix of classic furnishings and modern amenities. With multiple indoor living spaces, a formal dining room, and a huge backyard with more seating, this historic Murfreesboro vacation rental is perfect for entertaining together. 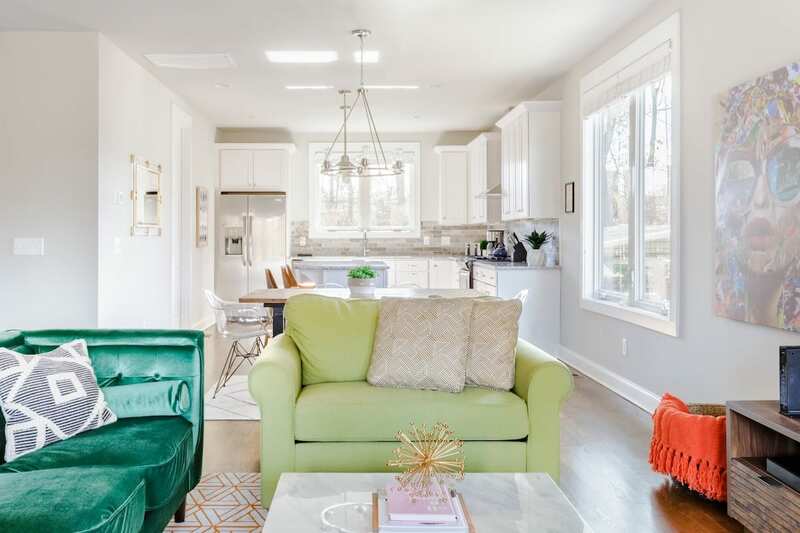 Our final pick is a fantastic group-friendly vacation rental in South Nashville, close to Kendall Park and just a short drive from downtown. This location offers added privacy and a more peaceful, residential vibe. It’s also very convenient to Nashville International Airport, where you can catch another shuttle bus from Nashville to Bonnaroo! Rates over festival weekend start from around $350 a night. This stylish and modern home can accommodate groups of anywhere from 4-10 guests! There are two big bedrooms which can be arranged with six beds in total, including sleeper sofas and high-quality air mattresses. There’s a great space in the living room to lounge and watch TV, while the modern kitchen is fully stocked with everything you might need. Enjoy access to the community swimming pool and golf course, too, perfect for relaxing in serious style after an exciting weekend at Bonnaroo.